Hyundai has finally rolled out the Grand i10 Automatic version priced at Rs 5.73 Lakh onwards. Though there is no official confirmation from the company, a south indian dealership of the Korean carmaker has carried an advertisement of the same in the newspaper. At a price of Rs 5.73 Lakh, Sportz Automatic Grand i10 is Rs 70,000 costlier than the Manual variant. The Asta version is pegged at approximately Rs 5.95 Lac. The Hyundai Grand i10 is offered only with the Petrol variant. Other available Automatic cars include Honda Brio A/T priced at Rs 6.15 Lakh, Nissan Micra A/T Rs 6.49 Lakh. 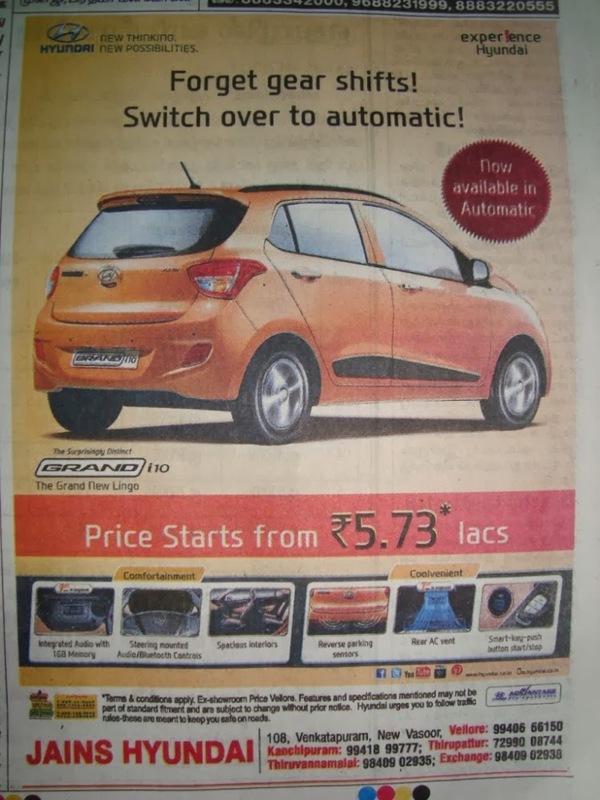 The Grand i10 Automatic is offered with same 1.2L Petrol engine as offered in i10 and i20 hatchbacks. Stay tuned for more information from the Korean carmaker.